South Haven Michigan vacation rental cottage: 3 story, 5 bedroom cottage for multiple families with fireplaces, jacuzzi tub, pool access, & main level accessible master suite! Near beaches of Lake Michigan! Office loft. 5 bedrooms, 3.5 bath, cottage that sleeps up to 14 guests. This lovely 3,400 sq ft cottage has 5 bedrooms and 3.5 baths and is perfect for multiple families. 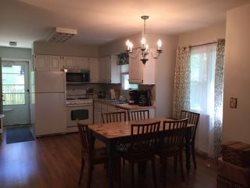 The sunny cottage has upgraded finishes, a wrap around porch, 2 fire places, granite counter tops, a built-in wet bar, stainless appliances, central air, washer and dryer, 2 flat screen TVs, premium hi-def satellite, WiFi and a gas grill. There is a convenient and accessible main level Master Suite that features a private full bathroom with jetted spa tub. The main level also has a powder room and open concept living room, formal dining room, and full kitchen with wet bar! Access to the attached garage is located off of the expansive kitchen, as well as multiple sliding glass doors to the wrap-around deck and grilling area. The second level has 3 guest bedrooms (two with Queen beds and the third with a pair of Twin beds) and a large office loft. The lower level has an additional guest bedroom with 2 sets of bunk beds (4 Twin beds total). A Great Room is also on the lower level and includes; a full bathroom, flatscreen TV, gas fireplace, dining/game space, and a Queen sofa sleeper. Located in the Harbor Club of South Haven Resort & Marina, the cottage includes access to the Woodland Harbor Marina, Resort club house and outdoor heated pool. The closest beach is a small public beach. It is just a 15 minute walk away and a little more secluded than the busy primary beaches. The Resort community is about 1 mile from downtown South Haven. -Main-level Master Suite with large walk-in closet and private full bath with jetted spa tub!